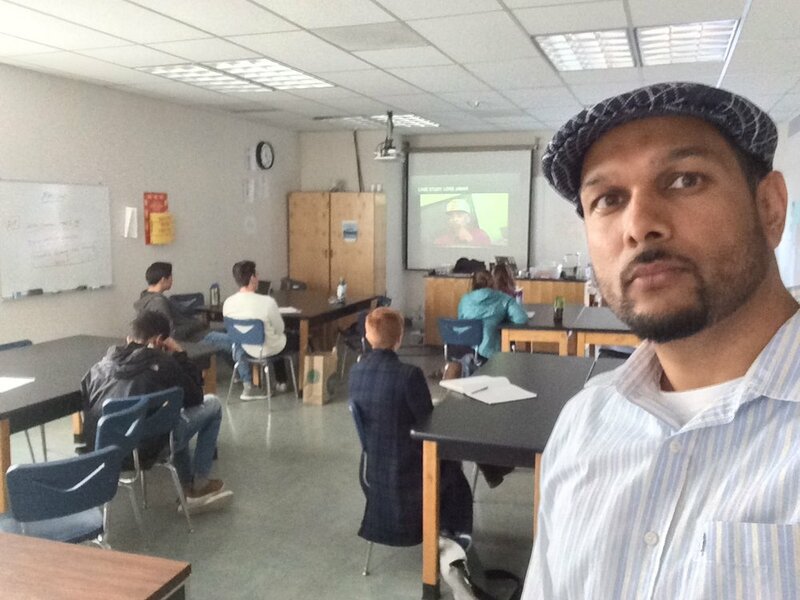 The Bay Area BlendEd Consortium was founded by five private independent schools (The Athenian School, The College Preparatory School, Lick-Wilmerding High School, Marin Academy, and The Urban School) to jointly offer a set of blended classes combining in-person and online instruction. Students meet face-to-face between three and five times in each course and where appropriate to the subject, courses take advantage of the unique learning resources of the Bay Area. The consortium helps the member schools prepare their students for the changing methods of instruction and communication they will see in college and in the workforce, while preserving the core relational culture that lies at the heart of their educational missions. Kalyan started his BlendEd journey as a teacher, and has recently moved into a new role of the Athenian School’s first Director of Teaching and Learning. In his new role he helps oversee Athenian instructors in Blend-Ed and has a hands-on approach to helping them succeed in teaching this way. “I’ve been a teacher for nearly two decades, and became interested in BlendEd because it allowed me to reach beyond my school and meet students from other schools while using a modality of learning that meets students where they already gather most of their information. I also was excited to teach a course on Hip-Hop, because it allowed me to both teach to my passions and model the marriage of scholarship with authentic expression. I taught the Hip-Hop history class one last time, and will be handing it off to another colleague this summer (SY 2016-17). I had planned on teaching a Comic Book Literature course through Blend-Ed, a course I not only developed in great detail, but similar to the Hip-Hop History course got approved by the UC a-g system for literature credit. Because of my new role, I have handed that off as well. in my teaching to help students connect with each other. Now as the Athenian School’s first Director of Teaching and Learning, I oversee teachers, curriculum and technology. This restructuring of our institution, gives our school the ability to be facile in terms of using technology to instruct, as a tool and maximize professional learning opportunities to do so. In my initial work, I recruited a key teacher to take the Comic Book Literature offering and will take a teacher I helped train two years ago, to take the Hip-Hop History course. Meanwhile, I’m working at Athenian to strengthen faculty in their ability to maximize use of our LMS (Canvas) in order for them to transition and take advantage of opportunities to propose, field and teach in the Blend-Ed model. I’ve been asked by students of other schools in the BendEd Consortium to write college letters of recommendation. I’ve been honored and take it as a sign that the connectivity is working through the courses we teach. An unforeseen challenge has been the scheduling nightmares that come from trying to make face-to-face sessions happen given the disparate schedules of the five member schools, in particular around spring breaks. This seems to gut the course of its cohesion from March to mid-April. I’ve gotten only positive affirmation from students who have taken the hip hop class. Some students wonder what the course is like, some wonder if being blended makes it too hard, others think it might be an easy course. But they all walk away with an in-depth understanding of cultural syncretism and how layers of history help inform the culture we study that is known as Hip-Hop. it is: go with the flow. Plan your course, but allow for change to happen and make room to be flexible enough to create spaces for students to navigate the uniqueness of their own schedules. how they can blend learning in their classroom with/ through technology, this alongside the fact that I now supervise and work closely with our new Director of Educational Technology, puts us in a position to give teachers the skills they need to be successful in a program like Blend-Ed. The other layer is around a method I found worked for me, and one that is clearly working for the teacher taking Comic Book Literature, and this is around how to plan a course to be successful in this model. I had particular takeaways from my own learning—and also the fact that I’ve been very proficient in getting courses approved for UC a-g credit—on how to plan something that can have the maximum impact in a blended model and not skip a beat. The method is loosely based on Grant Wiggins with some modifications, and this allows for teachers to plan in a modular way, and be flexible towards outcomes and student needs. My course on Hip-Hop is unique for high schools, but there are university courses on Hip-Hop and they are not without critique. One is that many courses are taught from a pure academic bent, and people in the Hip-Hop world view this type of curriculum as one devoid of a “lived in” understanding of Hip-Hop, which misses out on the aesthetic nuances of the culture and tries to break it down into elements, which are not truly how Hip-Hop as experienced by those who live it. Another critique is that academic courses that are taught by famous M.C.’s and other Hip-Hop artists, while providing a level of lived in experience, lack the academic punch of the scholarly courses. When I created this course, I wanted to avoid both pitfalls, and to do so, I had to wear both my teaching cap and the Kangol I sport when I am on the mic. So, a key element in the course and a measure for its success has been the XFactor album, which I released as the artist “Professor A.L.I.” and that I use as an audio reader for the course. Students use its instrumental beats to record responses to units, and release as their own songs, which has been greatly appreciated by everyone in the class. I believe that this has allowed students to appreciate the course for its authenticity and scholarly merit. I should have used the current beef between the artists Drake and Pusha T, which would have been more relevant to students and thereby catalyzed their engaged learning on the topic.